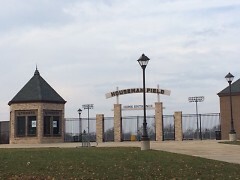 Growing up in Grand Rapids has created many lasting memories of places that are still standing today, such as Houseman Field. Important on a personal level, this place also has positively affected many generations before and after me. Grand Rapids as a city has seen great transformation in the last 10 years. As a 20-something adult, I live among the throngs of people who chose to transplant to this mid-sized city. But I’ve been here the whole time, and I have not forgotten Grand Rapids’ roots. Houseman Field is a prime example of the historic Grand Rapids, it’s staying power, and how much of the city has been here for a century or more. For most people, Houseman Field is just a football field in Midtown, smack dab in the middle of a residential neighborhood. But for anyone who attended high school in the urban areas of Grand Rapids as early as the 1930’s, it signifies so much more. The stadium was built in 1923 on land donated by former mayor Julius Houseman’s daughter Hattie. Improvements were made over the decades, but the original stadium stood until a renovation project took place in 2009. I am the youngest of four children in my family, and all of us attended Grand Rapids Catholic Central High School. Catholic Central has a long running history with Houseman Field: the first game ever played on the field was a match between Catholic Central and Sparta. Catholic won. 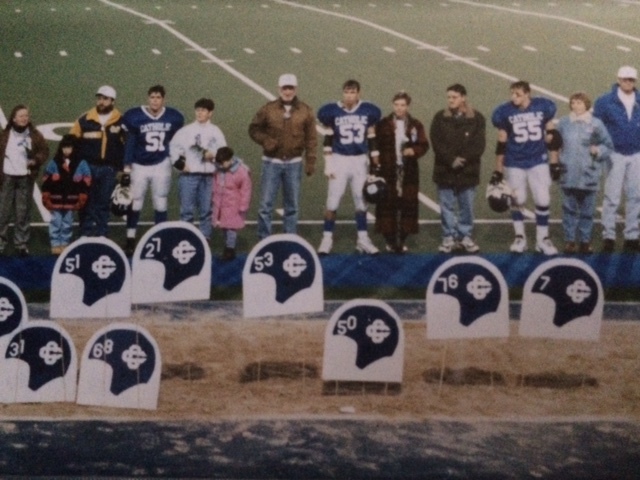 From that moment forward it was regarded as not only Catholic Central’s home field until 2008 but also Grand Rapids Central, West Catholic,Union, Creston, Ottawa and Grand Rapids Christian’s when the City League dissolved. It currently only serves as the home field for two high school football teams, Union and Ottawa Hills. In those 85 years, championships were won and lost, games played and memories made. Generations of alumni at Catholic Central all share in memories taking place at Houseman Field. In my 24 years, a large portion of my childhood memories took place here. It was like my home. It is where I grew up. As a child I witnessed the magic of this place. I saw what it meant to come together as team, and saw the dedication of generations of fans celebrating in the legacy of Catholic Central. Houseman Field was crucial in creating a world built on heritage and tradition. 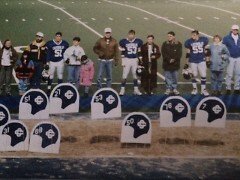 So many people came before me who played on the field, and so many would come after me. Before renovations, there used to be a hole in the chain link fence separating Houseman from the outside world. It was the perfect size for a kid to fit through, like a child size door. When we were kids, my sister and I used to enter and exit Houseman Field through this hole every single time we were there. As a high school student, Houseman was were I had my first crush and experienced my first heartbreak. Every Friday night in the fall was spent at Houseman Field, showcasing school spirit and cheering for the football team. It was here that friendships were made and strengthened. My memories of Houseman Field belie the fact I never actually played a sport on the field. My older brother Chad Hoop has different memories of Houseman Field than I do. Ask any graduate of Catholic Central pre-2009, or any Grand Rapids public school for that matter, and chances are Houseman Field is bound to come up in one if not many stories. It may hold different meaning for each of us, but one thing rings true: this familial place, this field helped shape so many Grand Rapids adolescents. This is where we spent our Friday nights; drinking hot chocolate and eating popcorn sold to us by the same mothers year after year.